Figure 1: A full rounded midcheek located high on the cheekbone conveys a powerful impression of vigor and youth. Conversely, a droopy or descended midcheek that hangs off the cheekbone is immediately associated with aging The midcheek is a very important aesthetic reference point of the face. A full rounded midcheek located high on the cheekbone conveys a powerful impression of vigor and youth. Conversely, a droopy or descended midcheek that hangs off the cheekbone is immediately associated with aging. 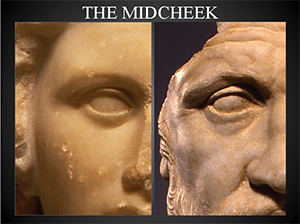 Addressing the midcheek is therefore an important aspect of the overall strategy to rejuvenate the face. 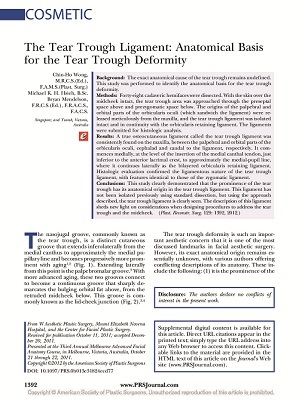 In this paper, Dr Wong and Dr Mendelson described the Tear Trough-Orbicularis Retaining Ligament Complex, the key structure that hold the soft tissues of the midcheek. Recent advance in the understanding of the midcheek anatomy, in particular the description of the tear trough-orbicularis retaining ligament complex by Drs Wong and Mendelson have allowed for the development of safer and more effective procedures designed to lift the midcheek. The choice of the approach depends on the patients’ specific needs, requests and concomitant procedures that are to be performed. For example, in patients presenting with eyebags who also has midcheek descent, a lower eyelid surgery with midcheek lift offers the ideal solution to address all aspects of mischeek aging without the need for additional incisions. Depending on what approach is selected, the procedure, incisions, recovery and potential complications differs. These will be discussed in detailed during the detailed preoperative consultation. Please visit us for an in-depth discussion on your specific needs.